A gospel-flavored adaptation of the traditional prayer featuring original music in a 3-track single version that includes instrumental only and karaoke tracks so you can sing it in your living room or church. 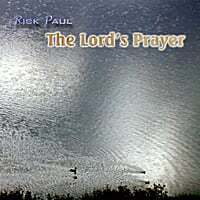 This 3-track single features an adaptation of the classic prayer I wrote back in college somewhere around 1981 or 1982. The extra tracks include an instrumental tracks only version and an instrumental tracks plus background vocals version to make it easy for you to sing this song in your church, living room, or wherever else you may be so inclined. While the song goes back to the early '80's, it was only publicly performed a couple of times prior to this millenium. The first time was in the church I attended back in college in Potsdam, New York. Then my brother sang it at my wedding in the Los Angeles area in 1983. It pretty much sat on the shelf after that, but I finally broke it out again after the current Iraq war started when I was playing at various bookstore coffeehouses. It just felt right at the time, and, despite the secular setting, it was quite well received, so I started doing it regularly. I've also heard of its being performed by singers in at least a few churches in other parts of the country since then.